The Spaniards adore their tapas, and this wonderful culinary tradition reflects the spirit of our escorted Best of Spain tour. You’ll sample the most appealing, intriguing sights from a sextet of cities, savoring Spain’s incredible legacy of art and architecture, its dramatic history and grand passions. Along the way, you’ll get a taste of the Spanish way of living, like el paseo, the leisurely evening stroll that often leads to a glass of wine and some tapas! From the Prado in Madrid to Granada’s Alhambra Palace and La Rambla in Barcelona, this “best of” tour serves up a multicourse feast of sights and experiences that are simply unforgettable. Take off on a nonstop overnight flight to Madrid. Cultural gem Cordoba hosts some of Spain’s most impressive monuments. It was also the birthplace of the great 12th-century Jewish philosopher Moshe Ben Maimon (Maimonides). 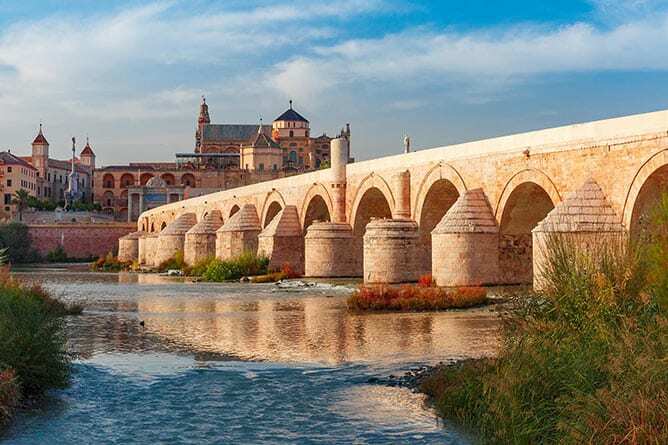 On our guided tour, we’ll marvel at the Mezquita (Great Mosque) built in the 10th century during Cordoba’s glory days as the capital of Moorish Spain. The mosque was later converted to a cathedral, but the fine original architectural details are stunning. We’ll also view the reconstructed Roman Bridge, as well as the beautifully restored 14th-century synagogue that survived the expulsion of Spain’s Jews…. 2019 Departures: Single room supplement is $749. For more information on this Spain tour, please contact us here or call us during business hours (Mon-Fri, 9:00-5:30 EST) at 800-337-7773. Reservations for tours in Spain can be made by phone (1-800-337-7773) and will be confirmed upon receipt of $300 per person non-refundable, non-transferable deposit which must be received within 48 hours of reservation. Full payment is due 75 days prior to departure. Baggage fees may apply. Space and prices subject to availability. For complete booking information and terms & conditions click here. The optional tours must be paid in cash. Optional tours are subject to a minimum number of participants and may be cancelled if the minimum is not met. Additional optional tours may be added for your enjoyment, and the optional tours listed below may not be available on all departure dates. Please note that optional tours are nonrefundable. Experience the food culture of Madrid like a local. You’ll sample Spain’s delicious tapas tradition on a three-hour foodie walking tour of Madrid. Go on a culinary journey through the regions of Spain, learning the origins of tapas and how each is made. Immerse yourself in Spanish culture by enjoying an authentic flamenco dance performance. Newly renovated hotel located in the heart of the city, five minutes from Retiro Park. Set on the border of new town and the old city, this modern hotel features a rooftop pool and solarium. Contemporary style, city center location and an outdoor pool enhance this hotel located in one of Seville’s most distinguished neighborhoods. Modern hotel with a pool sits near the Alhambra, just 10 minutes from downtown. Well-located hotel features a range of amenities. Modern hotel boasts a futuristic design and great location. Your departure flights from the U.S. and back are the following airlines with the corresponding schedules. We recommend you arrive no later than 3½ hours before your scheduled departure time. Please make sure to allow sufficient time for clearing immigration and customs if you are planning a connecting domestic flight. We recommend at least 3½ hours. Please keep in mind that flight schedules are always subject to change. Iberia Airlines and American Airlines do not assign seats in advance. Seat assignments can only be arranged at the airport upon check-in, and smarTours is not involved with assigning seats. If you have a preferred seating choice, please make sure you check in for your flight as early as possible. Main Tour: Land-only services start upon independent check-in at Madrid hotel on Day 2 of the itinerary listed on the tour page. Land-only services end after breakfast at Barcelona hotel on Day 12 of the itinerary listed on the tour page. You must be in possession of a passport valid for at least 6 months after the date of travel. Visa is not required for American passport holders. Non-U.S. citizens should check with the respective consulates as to the most current visa requirements to all their travel destinations. Please remember that it is your responsibility to obtain the necessary travel documents before the trip. Immunizations are not currently required. However, you may wish to consult your personal physician or local public health authorities about to their suggestions. Expect daytime high temperatures in the 60s to 70s in April and October, 70s to 80s in May and September, and 80s to 90s in June. The hotels used on this tour offer several dining choices from casual to specialty restaurants. Average cost for dinner (excluding drinks) in the casual restaurant is about $20-25 per person. Your hotel will accept credit cards for your non-included meals. Optional activities will be offered. Hotels and some stores will accept major credit cards. However, for “street shopping,” you will need local currency. You can either exchange U.S. dollars into local currency in advance of your trip or use your debit card to withdraw local currency from an ATM. It is recommended that you bring along cash in small denominations. Each passenger may bring one piece of checked-in luggage (suitcase) max. 44 pounds and one carry-on, not exceeding 18”x10”x8”. We recommend that you do not overpack and that you take a variety of casual separates with climate and comfort in mind. I've enjoyed various travel experiences with SmarTours since 2009, being able to visit Asia, New Zealand, Australia, Italy, and now Spain with them. For travelers looking for a cost effective experience that is both exciting, removes all of the headaches of travel logistics, and gives you the chance to feel the true essence of other countries, SmarTours has to be one of the leaders in their field. The lodging has always been exceptional, and especially on this Spain trip we were very impressed with the quality of the culinary choices that were available to us. We were able to venture out on our own as we liked and got to see major sites in all of the country's major cities. Tour director worked hard to please everyone. There was one couple that could never get enough, be considered first, or benefit the most We all called them the divas. Outside of those knuckleheads, the rest of us had a great time. Would say that Spain was less enthralling than South Africa or Italy. My friends and I thoroughly enjoyed this tour, and especially our tour director, Charles. He was delightful and very knowledgeable. The towels in a few of the hotels could have been softer, but other than, very nice tour. just returned from April 28 trip and having nothing but a high recommendation for the tour. Best value for this kind of trip. Have taken several tours with this company. There were 31 people on the tour. The buses were comfortable, the speaker system while touring great ithe hotels in general were excellent. And a bang up final dinner in Barcelona. Very much enjoyed this escorted vacation with my wife. *Nice hotels, *good meals, *great bus, *very well organized, *excellent, knowledgable, interesting tour guide (Roberto Barrantes),and *the price was a bargain. While I'm sure others in our group were happy to get some time on their own, we would've preferred additional escorted touring, or more escorted excursion options. We'd recommend this company for the Best of Spain trip and heard from our travel companions that this was their second or third trip with SmarTours. Had a wonderful trip with great participants, amazing weather and an awesome guide Derek. This was my first trip as a smart traveler the perks were great. The tour was wonderful. I really don't expect anything but the best from SmarTours and you did not disappoint. Thank you for another great travel experience. We recently returned from a Best of Spain tour (which started October 4 in Madrid), and we loved it. Let me start with the best part - the guide Carmen was truly outstanding. She was tireless in making sure no one got lost, no one fell too far behind, everyone's needs were met, and so on. On the tour bus, Carmen was incredibly entertaining, with an excellent sense of humor. Next, the hotels. Only one (in Cordoba) was five star, but most of the rest were still very good. In particular, the hotels in Madrid and Barcelona, where we spend most of our time, had fabulous locations, within walking distance of many important tourist attractions. The other hotels, in smaller cities, also had good locations and were fine - with one exception - the Abba Aceton Hotel in Valencia which was not well maintained. Included dinners were a bit disappointing (a little too bland), except for the last night in Barcelona which was excellent. Most of the places the tour bus stopped were quite interesting, although just about everyone would have been happy to skip the Ciscerian Monastery on the road to Barcelona. The city guides in Madrid, Toledo, Cordoba, and so on were all quite knowledgable, and each shared a tremendous amount of local pride and enthusiasm with the tour group. All in all, an excellent tour, and we will be sure to tell our friends about Smartours. Thank you. THIS HAS BEEN ONE OF MY BEST VACATION SO FAR.WE HAD A GREAT TOUR GUIDE LUIS WHO IS SO KNOWLEDGEABLE OF SPAIN AND WAS THERE TO MAKE US FEEL SO SAFE AND AT HOME AT ALL TIMES.MADE HIMSELF AVAILABLE WHEN NEEDED. The trip was amazing,our trip coordinator(Mr. Curulla) was super so as our local guides.The hotels (except for one)were more than you can ask for. Spain is amazing. Roberto was an excellent and knowledgeable guide. We are very active people, so the 2-3 hours of walking and standing was fine for us. Some tour members complained, so perhaps it should be noted that if you have mobility issues this might not be the best choice. This is our fifth SmarTours and we have recommended your company to many people. We flew on American Airlines. The flight from NY was in a smaller jet so not great. The flight back to NY was a wide body so much more comfortable and better food.